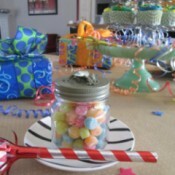 This page contains do it yourself party favor craft projects and tips. Glass Jar Party FavorsI found these very neat size jars after a holiday sale for .50 cents for a 3 pack. 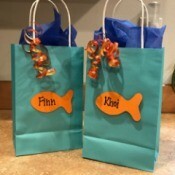 They come in handy for many things, storage, cooking, and even party favors! This project can also be made out of baby food jars. Here is how! Paper Fortune CookiesThese paper fortune cookies are quick and easy to make and a fun feature of any party or gathering. "Gerber" Baby Favors for 1st Birthday PartyFor my daughter's first birthday party, I made her into the "Gerber" baby by creating new "labels" for the jars. I started with a Word document and inserted a picture of her from my Kodak files. Paper Flower BowlThis paper flower bowl makes a lovely container for sweets and nuts. Make Boo-Boo Bunnies For a Baby ShowerI have been making boo-boo bunnies for half my life. Every time there is a baby shower in my huge family, I am the nominated favor maker. I just love making those darling little bunnies! To go with them, I always make a huge one for the baby's nursery. I fill it with baby wash cloths and a bar of baby soap.